I like to believe that I am a person that readily accepts change, but really I am not. Last week I finally got up the nerve to have some changes made on this site and I am so glad I did. I stayed with blogger but had a new makeover. Thank you Linda for everything you did, it is much better than I ever imagined. However I do love to try new foods. Have you ever seen a fresh garbanzo? Once you pop open up the pods you will notice that they are slight green in color. The flavor is similar to a fresh pea. There was not a lot of information available about how to prepare them. So I decided to peel them and throw them in a pot of boiling water for one to two minutes. I then drained and rinsed them to stop the cooking. Some were used in a salad and the rest I made into a hummus. Heat a large pan of water to a boil, add beans and cook for about 1 to 2 minutes. Remove from heat and pour through strainer. Rinse beans until cool. Place the garbanzos in a food processor with 1/4 cup water, the lemon juice, garlic, cumin, cilantro, tahini and olive oil. Blend until smooth. ( I kept mine a little chunky because I love that kind of texture). Taste and season with salt. Serve with veggies, crackers or pita chips. Thanks Tandy, we enjoyed our veggies with this dip. Thanks Dena appreciate your support. Cheri, thank for sharing the recipe. I have never made hummus. It must taste so much better made from scratch. It was my pleasure to give your blog a makeover. It looks fabulous, but if course I am partial. 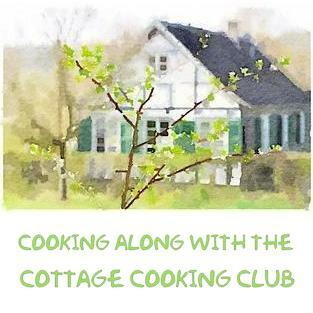 I would love if you share this at our link party, Dishing It & Digging It. The party is every Sunday. It is live now. Robyn joins every week. It's a good way to get more exposure. Thanks Linda, just linked up appreciate the invite. This is such a great colour. A really lovely recipe for using beans which is perfect for the summer. Thanks Caroline, it's fun finding ways to prepare veggies that are new to me. Thanks Anu! appreciate your feedback, Have a great week! Your new design looks beautiful! So clean and fresh! I've never seen fresh garbanzo beans, how fun! This was the first time I saw fresh garbanzos myself. had a fun time trying to figure out what to do with them. Thjanks Chris! Hi Cheri! I really love the new look of your blog! That was such a fun surprise when I clicked over. It is scary to make changes, isn't it? But it really is awesome. I had never seen raw garbanzo beans before! Did you get them at a farmer's market? Your hummus sounds so yummy, almost like a cross between guacamole and hummus. Definitely saving this one! yes I picked them up at the farmers market, have never seen them there before. Love the flavor but they are lots of work. Thanks for the feedback Shari!! change is scary. Thanks Tricia, they taste alot like a fresh pea, so glad you are feeling better. Thanks Raymund, they taste alot like fresh peas. This was the first time I saw fresh ones before at the farmers market. Fresh Garbanzo? Sounds interesting and delicious. Loved it! 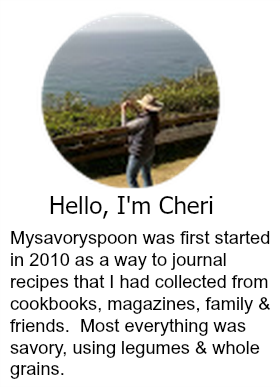 Cheri, I love the updates to your site! I am hoping for a "make-over" in the near future. I drag my feet with changes sometimes...Your hummus looks so fresh. I hear you Mindy I do too, I have always thought of myself as someone who loves change and adapts easily, but that is really not so. Look at you! Very impressive, both the new site and recipe! Simple yet aesthetically pleasing to the eye. You go Girl! Thanks Sandra, appreciate the feedback and encouragement, you are the best. Thanks Marvellina, don't be too hard on yourself, this was the first time I ever tried them myself. LOVE your new header and site update! So nice, Cheri!!! And I will have to watch for fresh garbanzos---I'd love to try this hummus. Thanks Liz, appreciate the feedback. I'm just loving your new page, Cheri, and every time I come to visit I see something new and beautiful. Isn't Linda fabulous?! I've never had fresh garbanzo beans but I definitely would love to try them. Love your pic and recipe. You're on fire, Girl! Ha! Ha! Robyn, you are so positive it is contagious!!! Thanks! What a beautiful plate! Healthy eating at its best. I haven't had fresh garbanzo beans in ages, Trader Joe's used to sell bags of them frozen and I'd buy them there all the time. This hummus looks fabulous! Thanks for the info Sara, I will check out Traders Joe's. New blog design looks GREAT! Hummus is my favourite dip and using fresh garbanzo in this classic dip makes it even more tempting. Thanks Angie, hummus is my favorite too, I was surprised at how green this was. Love your new look, Cheri - I meant to say so in my last comment! I am in the process of some changes myself for the fall... You are making me feel braver about it! I bought fresh chickpeas once in NYC, and they were wonderful sautéed. I would love to get my hands on some again to make your hummus! I was contemplating whether to saute them or not, I bet they taste delicious that way. Thanks David! Had fun, thanks for stopping by Lori! Me in the same room as hummus... A Mouth Massacre would ensue! LOL! Oh Cheri! I just love, love, love your new look!! It is so clean and fresh - great makeover. : ) I am so glad to learn about garbanzo beans here today. I'm always learning something new when I visit here! Keep up the great work! Thanks Monica, I finally got up the nerve to make the change, so glad I did. Fresh garbanzos were new to me too! Appreciate your feedback Kim, so glad I made the move. love the new design--very sleek and fun! this is a delicious creation. i'm 100% sure i've never eaten a fresh chickpea, but i'd love to try them, especially like this! They have a slight pea flavor, thanks Grace! This looks extremely yummy, I'd love to spread it on crackers. It looks so fresh too! Thanks for the hummus ideas racing through my mind now! Hummus is so versatile right? thanks for stopping by Pamela. my sis would love this, i'm sure. Hi Cheri! I love the new look on your site! I was so excited to have some updating done on mine last year! Looks very clean and fresh :) I love hummus, but I've never seen fresh garbanzos. This hummus looks super good! The fresh garbanzos were new to me as well, loved the taste. Thanks Marcelle! Thanks Johnny, so nice of you to stop by, I think they are edible as they are but too me they taste better if they are sauteed or cooked a little in some way. Take care!